class="page-template-default page page-id-4907 custom-background group-blog masthead-fixed full-width singular wpb-js-composer js-comp-ver-5.7 vc_responsive"
We will give away a weekly prize Friday October 3rd through the 24th. 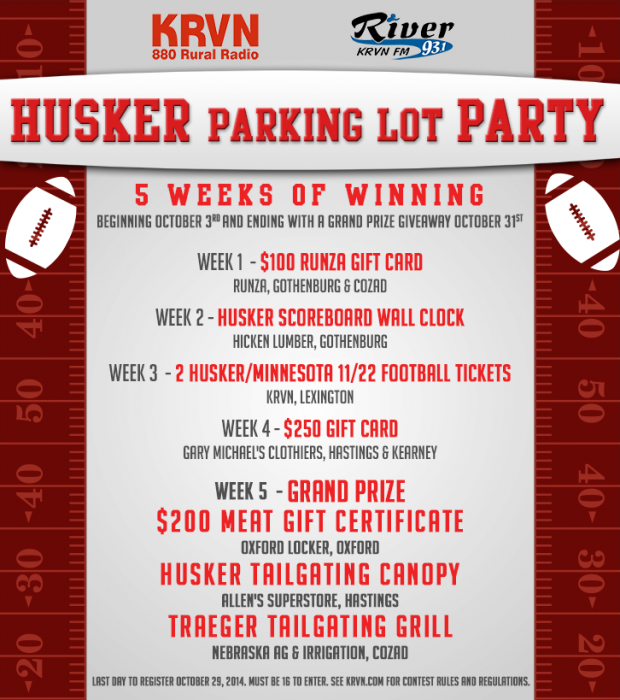 The Ultimate Tailgating grand prize package will be given away on Friday, October 31st. The weekly winners will be selected each week from the registration boxes and that week’s on air qualifiers. The grand prize drawing will include all qualifiers from the previous 4 weeks and the qualifiers from the Week 5 registration boxes and on air qualifiers. One entry, per day, per registration location please. Weekly and grand prize winners announced each Friday afternoon. You must be 16 to win. Payment of all federal, state, and local taxes is the sole responsibility of the winner. KRVN reserves the right to make changes in the rules of the contest, including the substitution of a prize of equivalent value, which will become effective upon announcement. Decisions of KRVN station management with respect to contests are final. Contests and promotions are subject to all federal, state and local laws.